As far back as 1982 I was teaching a senior and graduate level computer engineering course at Wright State University called "Real-Time Software Design". The students wrote code in assembler language and tested their projects on one of two PDP-11/05 minicomputers. Both systems were equipped with a teletype terminal, a line printer, two floppy disk drives, and the dreaded card reader. To pass the course, students wrote a spooler program that read cards, spooled the data to disk, read it off, and printed it. To achieve the necessary performance the software had to be multi-threaded and interrupt driven. The course was required for seniors to graduate and for graduate students to proceed to their upper level courses. It was much hated. And much loved. Fast forward to 2005 when I began to passionately and aggressively purse two goals. Find an economical hardware and software platform on which to teach embedded and real-time software development. It must support a gradual learning curve, accomodating beginners needing a gentle introduction, but also experienced developers who need to learn the advanced concepts used in bleeding edge commercial development environments. Demonstrate that the advanced object-oriented software techniques, idioms, patterns, and architectures that I have seen evolve for embedded software development over the past several decades can be applied to this small and inexpensive platform. This has resulted in a number of projects that long-time readers of this blog (if there should be any) will recognize. Cascada reflected my decision to move this effort to a more capable yet less expensive C4 BeagleBoard with a Texas Instruments OMAP system on a chip with an ARM Cortex-A8 processor, a Zippy2 expansion board, and a standard Linux distribution. Contraption had me upgrading to a xM BeagleBoard and moving to a standard Android distribution, which had the added benefit of a bundled development environment and support for Java, with a GNU environment co-hosted along side it. Horsefly was where I tried using a commercial toy, the Parrot AR.drone quad-rotor helicopter, which featured a custom ARM processor, as a platform to illustrate how to reverse engineer an existing system. Although I would call all of these projects successful, none of them really satisfied my goals. The hardware was too expensive. The software was too complex for beginners. They were too closed. Or they presented a target that was moving too quickly in the market place. Amigo is my latest attempt, using Arduino boards. These inexpensive platforms, available all over the web or even at your local Radio Shack, were originally built for teaching just the kinds of things I'm interested in. They have also proven immensely popular with hobbyists, do-it-yourselfers, and the Maker subculture, resulting in a huge hardware and software ecosystem growing up around them. They use low power but extremely capable Atmel megaAVR eight-bit microcontollers. The run-time software is already C++ based, and is simple enough that you can completely understand everything that is going on right from power up to running your application. The Arduino software distribution includes an easy-to-use integrated development environment (IDE) that makes it simple for beginners to get embedded projects up and running quickly. But can you start with Arduino and its small town ways but graduate to the big city of learning about commercial product development? Can you use Eclipse? Build using make? Use source control control? Unit testing? Can you do multi-tasking? Write interrupt service routines? Do systems programming in C++? Learn about code reuse across product lines? Could you use the open source FreeRTOS multi-tasking real-time operating system, write an interrupt-driven object-oriented device driver in C++, build it all with a makefile, maintain the code base in a Subversion repository, and run it on an inexpensive but highly versatile Arduino-compatible board? Can you do all of this so cheaply that a student could download the software for nothing off the web to their Windows, Linux, or Mac laptop? That they could conceivably buy a board at their college bookstore and keep it to use in a series of courses ranging from beginner to advanced? The shirt-pocket sized Freetronics EtherMega 2560 board uses the same Atmel ATmega2560 microcontroller as the Arduino Mega 2560 board. It includes a USB-to-serial interface to one serial port (and three more serial ports just waiting to be hooked up), an Ethernet controller with an RJ45 jack, a microSD card slot, and a big batch of general purpose I/O (GPIO) pins. It can talk to the Arduino IDE and run all the standard Arduino software. But this EtherMega isn't running Arduino. It's running FreeRTOS with a couple of concurrent tasks. Its interrupt-driven serial device device driver, and indeed all of the software stack sitting on top of FreeRTOS, was written by me, in C++. I built it via make using the GNU tool chain from my code base maintained in Subversion. I developed it using Eclipse running on my desktop Mac. A tarball of my entire code base, including all of the FreeRTOS code, is available via a link on my Amigo project page. You have to love the global scope of this. Arduino originated in Italy with founders Massimo Banzi and David Cuartielles . The Freetronics board was designed by Marc Alexander and Jonathan Oxer in Australia. FreeRTOS was developed by Richard Barry and Real Time Engineers, Limited in the United Kingdom. The FreeRTOS port to the EtherMega was done by Phillip Stevens in New Zealand. Arduino, its clones, components, and accessories, are manufactured, well, everywhere, including Italy and the United States. I can't remember when I've been this excited about one of my projects. I'm not kidding, my hands are shaking at the thought of it. The potential of this as a pedagogical tool is fraking huge. If you want to learn, or even better, to teach, embedded and real-time software development, it is time to quit making excuses. It hasn't ever been this easy, this accessible, or this inexpensive. Start now. If I can help you, I will. I did most of the development of Amigo, my noodlings with FreeRTOS, C++, and the AVR eight-bit microcontrollers, on the Freetronics EtherMega 2560. Here's a more recent photograph of the EtherMega with a test fixture wired up to it that the substantial Amigo unit test suite uses to exercise its various features, including its interrupt-driven USART, SPI, and ADC device drivers all written in C++. The unit test suite includes tests of the networking capabilities of the EtherMega to act as a client or as a sever. Of course I had to try to get at least a basic multitasking configuration working on the far more resource constrained ATmega328p microcontroller used on boards like the Arduino Uno, and the Freetronics EtherTen. The EtherTen is equivalent to the Uno with an Ethernet shield. I got it working, but it wasn't pretty. The 328p has one-eighth the flash memory and one-fourth the SRAM compared to the 2560. I ran the same Amigo software but with a radically lobotomized unit test program, enough to verify that I was multitasking and that the device drivers were working. The issue was tuning the stack sizes for each task and the heap that FreeRTOS requires so that each task could run without blowing its stack, and still leave room for the variables used by the unit test suite. This would have been an issue in C as well as C++. Here's a photo of that board without any test fixture wiring but running Amigo. This particular EtherTen has the optional Power over Ethernet (PoE) module attached to it. So while the 328p might be usable for a very limited application using FreeRTOS, I can't recommend using it as a learning or teaching platform for multitasking. You'll spend all your time (as I did) trying to find that memory allocation sweet spot. I've written before here about using Android as a platform on targets like the BeagleBoard. Recently I did some work on the Hardkernel ODROID-A4 as part of my Conestoga project. The ORDOID-A4 is Samsung's recommended product development platform for their Android-based Galaxy smartphones. The ODROID is not cheap, and architecture-wise it's extremely complex compared to the Arduino targets. But if your goal is to develop below the Java layer for Android smartphones, it and the other ODROID models are an interesting choice. Here's a photo of my ODROID-A4 plugged into its debug board, when an accessory I/O board sitting alone just above it. You'll also notice a lovingly handcrafted universal reset tool (a bent paper clip). At the opposite end of the spectrum, I've been working on a gig recently in which I've been developing firmware for a line of commercial products based on the Microchip Technology PIC16F1823 microcontroller. This tiny beast, yet another Harvard architecture, has 2048 words of flash for executable code and a mere 94 bytes of RAM. That's a little tight for a teaching platform: even though I write in C, I have to carefully consider the resource tradeoffs of every single line of code and variable. Legitimate pedagogical issues for beginning embedded developers get squeezed out pretty quickly. It turns out that important concepts like abstraction and dependency injection are not free when a single byte takes up more then 1% of the entire available memory. But it's remarkable how complex your software can be within constraints as tight as these. One of my colleagues taunts me as he writes code for his larger microcontroller: "I think I'll have a variable. It'll be used for just one thing. I think I'll make it four bytes. It doesn't need to be four bytes. But what the heck." There has never been a better time to learn how to develop software close to bare metal. Moore's Law works to your advantage when you're scaling down just as it does when you're scaling up. I needed an ARM-based board that could host Linux to test the latest version of Diminuto, my C-based Linux systems programming tool kit that has found its way into a number of commercial products. Instead of pulling one of my BeagleBoards out of storage for this project, code-named Cobbler, I instead spent a (very) few bucks and bought a Raspberry Pi. This credit-card sized board features a Broadcom BCM2835 system-on-a-chip with an ARM11 core running at 700MHz and hosts a version of the Debian distribution featuring the Linux 3.6.11 kernel. Here's a photo of my lab bench setup where I am testing the general purpose input/output (GPIO) handling functions in my tool kit. The tiny RPi is festooned with cables (clockwise from the top): HDMI to my lab monitor, USB power, a ribbon cable to the breadboard, USB keyboard and mouse, and Ethernet. The breadboard has an FTDI Friend providing USB to logic-level serial access to the processor console port. I still recommend the Arduino if your goal is teaching very low-level device handling; Linux places too many layers of abstraction between your code and the hardware to make a good teaching platform for beginners. But once students have outgrown the Arduino, the RPi is an interesting next step. Because so much of my paid work is on ARM-based processors of one kind or another, it pays for me to have an ARM-based reference platform. You can see this strategy in play going all the way back to the earliest platform discussed in this article. 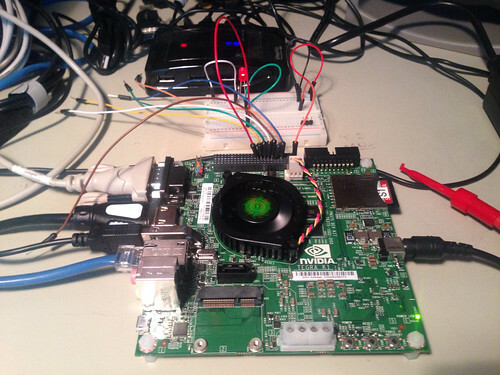 Here's the latest one: an Nvidia Jetson TK1 evaluation board, for a project code-named Stampede. The round device in the middle is the integrated cooling fan on top of the Nvidia Tegra TK1 SoC, which has four ARM Cortex-A15 cores, a fifth low-power Cortex-A15 core, and 192 graphical processing units (GPUs). The fact that you can buy this much horsepower for only USD$192 is amazing to me. At that price, the GPUs are merely a nice to have and don't represent my core interest in the board. The ARM Cortex-A15 implements the 32-bit ARMv7 architecture. When Nvidia inevitably comes out with one of these boards using their new Denver processor, which has two ARM Cortex-A57 cores implementing the 64-bit ARMv8 architecture, I'll be in line for one of those too. While trying to bring up FreeRTOS on a Freetronics EtherMega board (all the "Free" prefaces here being coincidental) as part of my Amigo project, I spent more hours than I care to admit figuring out how Arduino gets from power up to executing my software, a long and involved process whose explanation I found to be widely distributed and not easily forthcoming. This article details that journey. I'll warn you right now: this is long and rambling, covers a lot of territory, and is fairly technical. Everything I'll be describing in this article relates to the EtherMega board and its ATmega2560 microcontroller, but is equally applicable, differing in only very minor details, to other Arduino boards and their eight-bit Atmel microcontrollers. Much of it applies even to non-Arduino uses of those microcontrollers. In fact, much of what I describe about the tool chain applies to any platform using GNU compilers, including Mac, Linux, and Windows. The EtherMega is a Freetronics clone of the standard Arduino Mega board, an Arduino board that use the ATmega2560 microcontroller. The ATmega2560 has significantly more resources than the ATmega328P used on the smaller, cheaper, and more common Arduino Uno board. The 2560 has 256 kilobytes (KB) of persistent flash memory compared to the thirty-two KB in the 328, eight KB of non-persistent static random access memory (SRAM) compared to two KB, and four KB of persistent electrically erasable read-only memory (EEPROM) compared to one KB. These additional resources make multitasking much more palatable since there is much more SRAM to hold the context, including the stack, for each task; although FreeRTOS has been ported to the 328, the restrictions on stack space, a resource that is especially critical if you are coding in C or C++, make it a little problematic for my purposes. Here is a photograph of the EtherMega with a universal serial bus (USB) cable on the left connecting it to my desktop Mac, and a ribbon cable connecting it to an Atmel AVRISP mkII device that is off screen. More on that in a bit. In case the scale isn't apparent, this board is about four inches or ten centimeters in length. There's a lot packed in there. The ATmega2560 chip is the big one at the upper right. Besides all the usual general purpose I/O (GPIO) headers found on the Arduino Mega, the EtherMega also has Ethernet, a microSD card slot, and the hardware surround for each. This makes it a combination of the Arduino Mega and the Arduino Ethernet shield all on one board. This bundling of network protocol stacks or other advanced functionality inside a chip is very common on small embedded systems. It is not uncommon for an peripheral chip to have a more powerful microcontroller core embedded within than the external microcontroller for which you find yourself writing software. In fact, external microcontrollers, and the software we write for them, are frequently little more than glue used to integrate many other powerful components like ASICs and field programmable gate arrays (FPGAs) together and provide some small level of digital control to their management or their interface to the outside world. The ATmega2560, like the rest of the Atmel ATmega family, and indeed most small microcontrollers, is a Harvard architecture: the machine instructions that it executes are stored in a completely separate memory from that of the data on which those machine instructions operate. The machine instructions reside in persistent flash memory, which Atmel refers to as program memory, and the data reside in non-persistent SRAM or data memory. This is in contrast to the larger microprocessors found in servers, your desktop, or even your smartphone, which are Von Neumann architecture: instructions and data reside in a common non-persistent memory, typically RAM, having been copied from some persistent store during the process of booting. This physical separation of program and data memory makes for a slightly different style of programming than you may be accustomed to. Fortunately, many of the details of dealing with this are handled for us by the tool chain and its library, which in our case is the GNU C and C++ compiler, the GNU assembler, the GNU linker, several GNU utilities, and the non-GNU and decidedly non-POSIX compatible AVR-specific C library. In addition to flash (program) and SRAM (data) memory, the ATmega2560 used in the Mega, the Mega ADK, and the EtherMega, as well as the ATmega328P used in the Uno, have a second memory, EEPROM. EEPROM can be used to persistently store application-specific read-only parameters. Unlike program memory, instructions cannot be executed from EEPROM nor can data be read directly from it; it has to be accessed more like an I/O device. Finally, all of the AVR microcontrollers have a few additional bytes of persistent read-only memory: several bytes of signature that identifies the specific model of chip, lock bits that control who can write where and when into EEPROM and flash, and several bytes of option bits that control how the chip itself operates, including what it does when power is first applied, bytes that Atmel refers to as fuses. The ATmega2560 has three fuse bytes: an extended fuse byte, a high fuse byte, and a low fuse byte. Like the flash memory and the EEPROM, these fuses and lock bits (and, I'm assuming, even the signature) can be modified using the right tool. But fortunately for us they are not easily changed by software. As we shall soon see, this is how the microcontroller defends itself from what my Bell Labs colleagues referred to as death by download: the reduction of a device into little more than a space heater by loading software into it in which a bug breaks not just the device's function but the software download mechanism itself, a catastrophic event that is known as bricking the device. The internet is full of tales of people bricking their smartphone while trying to to jailbreak it: loading software on it unencumbered by vendor-imposed restrictions. Once bricked, a device frequently requires a specialized tool, like an in-system programmer (ISP) in order to recover it. The ISP is typically more expensive (sometimes much more so) than the bricked device. It is for this reason that embedded developers worry a lot about death by download. It's bad enough when the device rendered useless is a smartphone. It can be much worse when it is a core component in a multi-million dollar telecommunications system. Or a mission critical public utility, medical, or defense system. Or a space craft. My friend and occasional colleague Steve (a.k.a. The Space Cowboy) worked on the NASA Deep Impact comet probe and tells me stories of unmanned space probes launched with just the flight control avionics and a downloader. The remaining mission software was written back on Earth while the probe was in route. Talk about a hard deadline. You can be sure that that was the most thoroughly reviewed and tested downloader ever written. BOOTRST determines at what address the microcontroller initially starts executing code when power is first applied. The unprogrammed value of this bit is the value one (1). Unprogrammed means right off the assembly line, because when they are erased or before they have been programmed for the very first time, flash and EEPROM memory devices revert to a state of all one bits; this isn't really a design choice, it is a consequence of how they work at the silicon level. A BOOTRST value of one causes the microcontroller to start executing code at address zero (0x0) in the program memory. Location zero is known as the reset vector: typically what you program at this address is a jump machine instruction to the start of your program elsewhere in program memory. It's called a vector because it points somewhere else. It's done this way because the reset vector is just the first of many successive words that are vectors for other special conditions detected by the hardware, like interrupts or requests for service from hardware peripherals or even from devices outside of the microcontroller but connected to it via an external interrupt signal. This is where the boot lock bits come in. To avoid death by download, the BLB01, BLB02, BLB11, and BLB12 bits in the EEPROM are coded to prevent the boot loader from writing into the boot loader partition of program memory. The boot loader is electrically prevented from writing over itself. In order to overwrite the bootloader, you need a special tool like the in-system programmer, a device that can write to program memory or even the EEPROM inside the microcontroller without running software on the microcontroller itself. The Atmel AVRISP mkII is one such device, although there are others capable of doing the same functions, and sometimes other useful things like debugging. Here is a photograph of an AVRISP connected to the EtherMega board. The ribbon cable from the AVRISP connects to a six-pin header on the EtherMega. (And on the Mega and Uno boards too. There is even a second six-pin header for programming the ATmega8u2 microcontroller; don't mix them up.) In the photograph below you can see the six-pin header on the EtherMega just below and right of the microSD card slot. If you squint you can barely see a tiny yellow "1" printed on the circuit board at the upper left of the header; this tells you how to orient the ribbon cable, which has a (barely visible) matching triangular arrow on its plastic connector near where the ribbon cable attaches to it. If you decide that you want your Arduino board to always execute your application and you don't intend to ever load other software into it (or if you do so, you'll need use an ISP instead of the bootloader software), you can actually use an ISP to change the fuse and lock bytes, and overwrite the program memory that would otherwise be occupied by the bootloader. Most of us will never have a reason to do this, but if you are using an Arduino in a fixed production application, this is a quite reasonable thing to do. Every time power is applied, the microcontroller will jump through the reset vector into your application. I mentioned a protocol that the boot loader software running on the microcontroller understands. 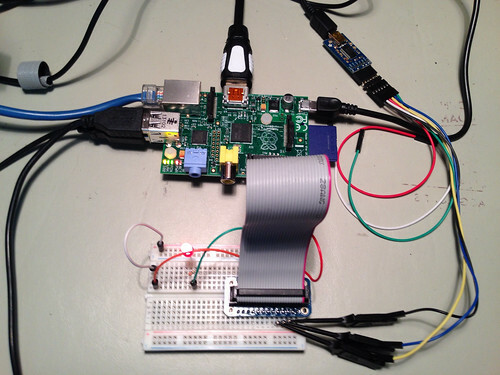 What's using that protocol to send the binary application image to the microcontroller? For most of us, that would be the open source AVR Downloader UploaDEr utility, or avrdude, although other similar proprietary Atmel tools serve the same function. avrdude runs on your desktop and speaks to the Arduino boot loader. It's what the Arduino integrated development environment (IDE) uses to download your compiled sketch onto your board. It turns out that avrdude can also speak to any number of ISP devices, including the AVRISP mkII. And there is some reason for you to want it to do so. It turns out that part of the boot load protocol involves commands for reading, and even modifying, the signature, lock, and fuse bytes in the EEPROM. Unfortunately, the Arduino boot loaders don't implement the complete boot load command set that avrdude can generate. Specifically, when you try to read EEPROM bytes using avrdude, the Arduino boot loaders lie to you, returning a hard-coded signature no matter what the actual underlying device is, and returning zeros for all the fuse bytes. This confused an old man for some time and made me even more cranky. Hence the AVRISP mkII in the photographs. Jumping to to the start of the boot loader code in program memory, or even to the reset vector for that matter, is not the same thing as resetting the system, because it doesn't reset the hardware back to its initial state. That's why Atmel recommends that if you need to reset the system from inside your code, you use the watchdog feature on the microcontroller itself. Watchdogs are hardware functions built into many processors that reset the hardware in the event the software goes insane. Insanity is usually detected by the software failing to periodically perform some action on the watchdog hardware, like set a bit in a special register. Your software can deliberately stimulate the watchdog to reset the both the hardware and the software in your system. So now we have software running on our microcontroller. Ah, not so fast; what code does the reset vector actually jump to? main()? Fat chance. For C this includes setting the values of variables that are not automatic (that is, global or static variables, not temporarily allocated on the stack while executing inside a function) and for which you coded an initializer. Here's an example from Arduino's EthernetClient.cpp. For C++ this also includes running constructor methods (and when your main program exits, destructor methods) for objects that are neither automatic nor allocated on the heap (that is, via the C++ new operator, which, by the way, the GNU AVR C++ library doesn't implement). Here's an example from Arduino's HardwareSerial.cpp. To understand how all this initialization gets done (and how the corresponding finalization gets done at program termination) we have to first look at what the GNU linker actually does. You can see why it would be especially useful to do this on a Harvard architecture: bytes in the text segments must be loaded into program memory; bytes in the bss segments must be reserved in data memory and zeroed out during initialization; and bytes in the data segments must be stored in program memory and then copied into bytes reserved in data memory during initialization. But the process is similar even on Von Neumann architectures since the text segments are typically placed in memory pages in RAM that are marked as read-only using a memory controller. Conceptually, the linker concatenates all of the text segments, all of the data segments, and all of the bss segments, from all the object files into one big binary image. It then looks through the text and data segments in that image for any unresolved external references, that is, pointers to external variables or calls to external functions. It tries to find those variables and functions inside your image, and if it finds them, it fixes up the addresses to point to the right places. If it doesn't find them, it starts looking through all of the libraries you've told it about. If if finds them there, it appends the appropriate library routines to your binary image, and again fixes up the addresses to point to the right places. Because the library routines may themselves have unresolved references, it may have to do this several times. If it successfully resolves all of the external references by iteratively repeating this process, then it's done. It it doesn't, you get a link error. But of course it isn't that simple. Each individual object file, whether it is one of yours or from a library, has its own requirements for initialization and finalization. All of those individual snippets of initialization code has to be done before your main program begins, and all of those individual snippets of finalization code has to be done after your main program returns. This is dealt with by associating those code snippets with named sections, which is just a way for the software developer to further classify byte snippets in the object file that is orthogonal to their segment classification. By convention, the AVR tool chain supports sections with names .init0 through .init9, and .fini9 through .fini0. (The order there isn't accidental.) There are both assembler directives (if you are writing code in AVR assembler) and compiler directives (for C and C++) that tells the compiler which, if any, of these sections you want a particular code snippet to be identified with. For example, the code below, from the stk500v2 boot loader used on the EtherMega board, specifies that the function __jumpMain is to be in section .init9. This is just an instruction to the linker regarding special handling for this particular function. Remember way back when we talked about the reset vector at location zero in program memory? (It seems so long ago.) When you compile, link, and download your program into your Arduino, that reset vector ends up being a jump instruction to the entry point of a routine from the AVR libc.a library and which can be seen in the assembler source file gcrt1.S. The entry point name for that assembler routine is __init, and the reset vector contains nothing more than the instruction jmp __init. This GNU C Run-Time routine #1 executes all of the initialization code in section .init0, then all the code in .init1, and so forth all the way through .init9. By convention, .init2 contains code to set up the stack; .init4 has code to initialize the data and bss segments; .init6 has calls to the C++ static and global constructors; and the code in .init9 is as simple as the instruction call main. Similarly, when your main program returns, all the code in section .fini9 is executed, then .fini8, all the way down to .fini0. By convention, .fini9 contains the code implementing the C _exit function; .fini6 has the calls to the C++ static and global destructors; on most platforms, code in .fini0 would signal the operating system that the application is complete. Since Arduino has no operating system, .fini0 goes into an infinite loop. So, I guess that __init routine is in .init0, right? Yep. And it just calls all that other initialization code, right? Nope. It doesn't have to. In fact, for the most part, __init doesn't even know about any of that initialization code. It's actually simpler than that. Every time you link your application the GNU linker uses a linker script. This is a script written in the linker's own language that tells the linker how to put together a executable binary image for your particular processor. You can provide your own linker script, but if you don't, a default one specific to your processor architecture is used. These scripts live in a directory inside the GNU tool chain called something like /lib/ldscripts, depending on where your tool chain is installed. The ATmega2560 microcontroller on the EtherMega is an AVR6 architecture, and it uses the script name avr6.x. The ATmega328P on the Uno is an AVR5 architecture, and it uses the script avr5.x. Perhaps you perceive a pattern. In the article Hidden Variables: Arduino and AVR Microcontrollers, I described how to display the implicit preprocessor symbols inserted into your source program by the GNU compiler. One of these symbols tells you what your microcontroller architecture is. You can find these scripts on your own system. Here's a snippet right from the avr6.x script from the GNU tool chain on my desktop. This snippet instructs the linker to append all of the code in .init0 to the application image, then all the code in .init1, all the way through .init9, then all of the code in .text segments that are not otherwise classified, then all of the code in .fini9, and all the way through .fini0. It merely concatenates all of these sections in the order specified by the script. So __init doesn't have to call the code in .init1 or even know about it. It merely falls through to the code in .init1. When .init9 does the call main the very next machine instruction, the one that will be executed when main returns, is jmp exit. This is a little assembler routine in the C library that can be found in exit.S which does nothing more than disable all interrupts and execute the instruction jmp _exit. That's an entry point to a routine that can be found in the GNU libgcc.a library and which can be seen in the assembler source file libgcc.S. That routine is in section .fini9, from whence execution falls through all the way through .fini0. If you write code for Arduino then you already know that, unlike most C and C++ based development platforms, you don't actually write a main program for your sketch. Instead, you just write setup() and loop() functions. That's because main() is already written for you. It resides in the file main.cpp. Here is the source for that file from the Arduino 1.0 distribution. You can see that main() calls its own init() function, then your setup() function, then calls your loop() function in an endless loop while checking for data on the serial console port. My adventures with Arduino continues. What I really like about Arduino, the GNU tool chain, and the AVR C and GNU GCC libraries, is that you can actually figure this stuff out. It is not opaque. It's complicated, but not too complicated. It's mysterious, but only for a while. For sure it's the best platform I've seen so far on which to teach embedded and real-time development. Denizens of the Great State of Colorado like to boast that we have 300 days of sunshine per year. That's a little misleading: the Colorado Climate Center says that although the sun does indeed come out for at least an hour 300 days of the year in Colorado, only 115 days can really be said to be those classic clear sunny days. But do we get enough sunshine to run an Arduino Uno board with an Xbee radio? There was only one way to find out. I connected two six-volt solar panels (Radio Shack P/N 2770052) in series to get a voltage somewhere in the range of what the Arduino Uno would find acceptable, and connected the combination to an M-type coaxial DC power plug. I wrote a little Arduino code to just print a time stamp, loaded it into an Uno powered by its USB cable, and tested it. I asked one of the cats where the sunniest spot was right then; Petronius assured me that in the breakfast area near a flower pot was the place to be. In the photograph below you can see the solar cells in series, the Arduino Uno, and a SparkFun XBee shield with an XBee Series 1 radio on top of it. I had to position the solar panels just right to get enough juice to power both the Uno and the XBee radio. But with a little fiddling, all the right LEDs came on and started blinking. I went back to my office a floor above and pointed the Arduino IDE Serial Monitor tool at the XBee that was USB-attached to my Mac Mini. I was rewarded with this output from my Arduino program. Here's the simple little program that generates and prints a time stamp with approximately millisecond resolution. The Xbee shield is setup to route the serial output of the ATmega328P microcontroller over the wireless serial link between the two radios. I continue to look at low-power automation and wireless networking and alternate power sources for my Amigo project. In the long run what I would really like is a combination solar/LiPo battery combination. But this was a useful first step. The one pair of six-volt panels in series proved a little weak for reliable operation. So I built a second identical fixture and connected the two fixtures in parallel to get more power. Here's what it looks like now. Here's the next iteration of this project. Clockwise from top left: a 7A solar charge regulator, an Arduino Uno with an XBee shield, a 12V sealed lead-acid rechargeable "gel cell" battery, and a 12V 1.5W solar battery charger. I definitely went the cheap route on this new setup, the battery being the most expensive component. The idea is that the Arduino runs off the battery, which is charged by the solar panel. I'm experimenting now with seeing how long this can keep running, starting with a fully charged battery. The software on the Arduino wirelessly sends a heartbeat to my desktop, which logs it with a timestamp. The heartbeat message indicates how long the Arduino has been running since its last reset (which would happen if the power fails and later returns). The output is logged to a file so I can see what happens overnight. My guess is a (much) larger solar panel and maybe a better solar power controller would be necessary if this evolved beyond the experimental stage. I went to a larger 5W solar panel, then to much larger 15W solar panel. We'll see if that's enough to charge the 12V battery during the day and let the system run all night. I also had to go to Xbee Series 2 radios with external antennas on both the Arduino Uno with the Xbee shield, and on the Xbee Explorer that is USB connected to my desktop, in order to get the range I needed, which was just a few tens of yards from the south-western edge of my back yard to my home office on the south side of my house. Here's the "instrument pod" with its external antenna visible at the lower left. Here is the instrument pod in my back yard connected to the largish 15W solar panel. Here is the tiny Xbee Explorer, with its own external antenna, USB attached to my desktop Mac. I'll monitor this for the next few days and see what happens.